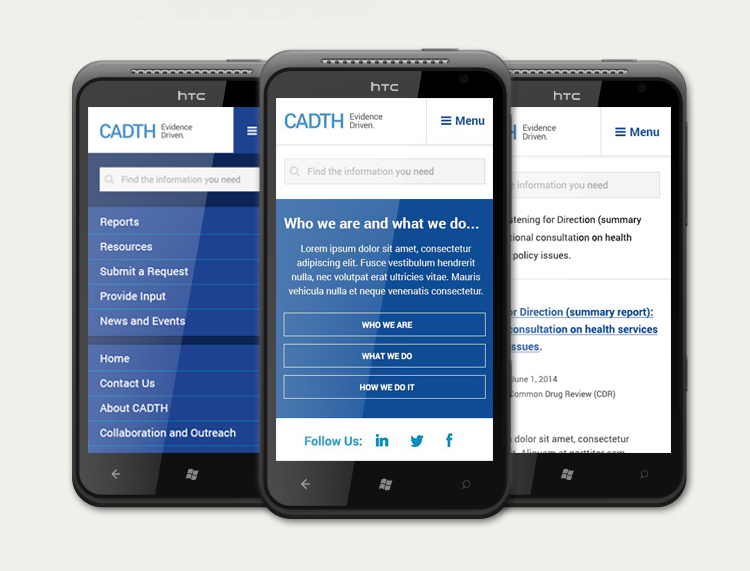 The Canadian Agency for Drugs and Technologies in Health (CADTH) publishes a large amount of rich content on a regular basis to their users. As a result of the wide array of subjects within the drug and technology industries, their previously existing website had become highly segmented and at times difficult to navigate. Cheif among the requirements for a new website was a streamlined information arcitecture (IA) and design which would enable users to better locate relevent content. 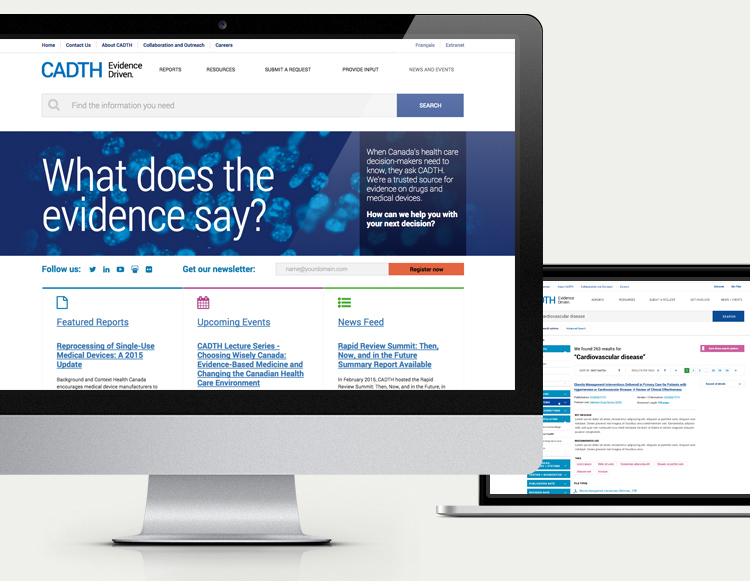 In 2014, Industrial began building out a brand new web presence for CADTH, that would resolve these needs to make their content easier to find and consume. Drupal was chosen as the base content management system for the application as it excels at handling large volumes of published content. The recommended IA pulled much of the information away from a deep hirarchy and instead relied on a highly effective search indexing tool called Elasticsearch in order to help users find content. This tool allowed for deep indexing of attachments to Drupal nodes, and the interface provided almost instantanious filtering of thousands of content records. Any time a website is being migrated across CMS platforms, it is an enormous undertaking. Many factors need to be considered which include URL structure, navigation, link redirection, and ensuring that any styles or formatting do not break. 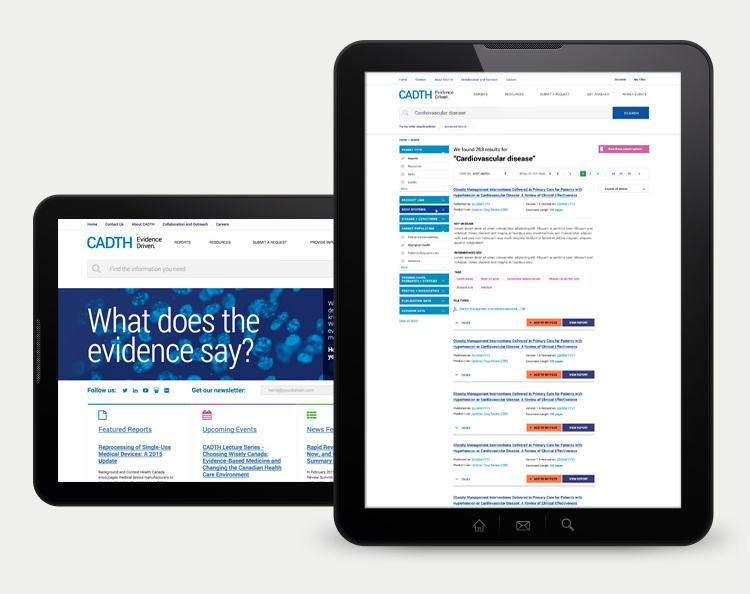 With CADTH, over 10,000 unique content pages needed to be migrated to the new website. In addition, the highly specialized nature of the content meant that it also involved the migration of countless unique field collections, and taxonomy structures. Because of Industrial’s extensive specialization with Drupal, we were able to build upon the community supported modules for content migration and customize them for CADTH’s specific needs. With a well planned migration strategy, the team was able to ensure that content could still be entered into the previous CMS very close until launch, and then a coordinated content cleanup effort could be done in Drupal in the final week. On April 1st, 2015 CADTH.ca was migrated to provide an entirely new web presence. They launched a website that incorporated their new branding, drastically improved the searchability of their content, and provided an easy to use content management experience. The feedback on Industrial’s search first strategy has been very positive. Users have praised the efficiency and accuracy of the search results and content is now far more accessible. Looking forward, the successes with CADTH paved the way for associations and businesses that have a heavy focus on content creation, to drastically improve the user experience of their website. The benefits of Industrial’s approaches to using faceted search and developing a user interface with a search first focus can be applied to help these organizations improve the user experience of their digital presence.